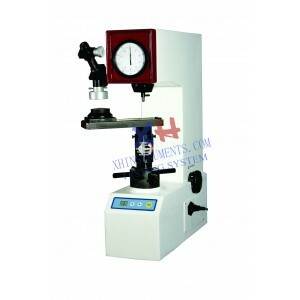 .XHL-08 Universal Hardness Tester ﻿is adopted automatic shifter to load, dwell and unload testing force, rotate the Load-Change Hand Wheel to change values of testing force, therefore the operation for this instrument is simple, easy and quickly. Beside set zero to the dial, there is no man made error for operation. The present instrument is with high sensitivity and stability, so as fit for usage in workshop and testing laboratory. The Distance from the Indenter Central Point to the Instrument Body:165mm. The Overall Dimension of tester: 520X240X700mm(Length X Width X Height).